When harvesting cilantro, it's important not to pick too many stems at a time. This will weaken the plant and future production will be poor. 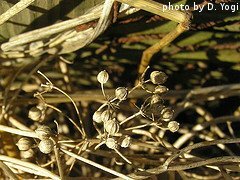 If you wait to harvest the coriander seeds, it doesn't matter if you do damage to the plant, as it is near the end of its life cycle anyway. Each cilantro plant grows from the center and develops stems that branch out. It's best to harvest just the outer stems. This leaves the center of the plant undisturbed, allowing for future growth. When harvesting cilantro stems, use a knife or shears and cut them off near ground level. Be careful not to accidentally cut the center stem. It's also a good idea to only harvest about 1/3 of the stems at a time, leaving enough to keep the plant strong and healthy. It's best to use cilantro as soon as possible after you harvest it. Rinse off the stems and leaves with water. Pluck the leaves from the stem. Before adding cilantro to any recipe or dish, roughly chop the leaves. This will release more flavor and aroma that is stored inside the leaves. If you need to wait a few days before using cilantro, don't rinse off the stems and leaves. Just bundle the stems with a rubber band and place them in the refrigerator. You can also store the stems in a vase with the bottoms sitting in a little bit of water. They will stay fresh for 2-3 days maximum before starting to wilt. 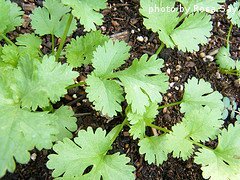 Cilantro leaves lose most of their flavor and aroma if they are dried. To store fresh cilantro leaves long term, freeze the leaves in cubes of water. 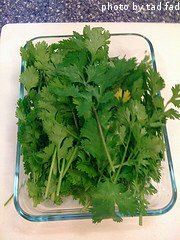 When used, frozen cilantro leaves don't taste as good as fresh ones, but they are much better than dried leaves. You can also add freshly chopped cilantro leaves to butter, using 1 part cilantro leaves to 2 parts butter. This butter can be frozen for later use. Coriander seeds are harvested near the end of the plant's life cycle. They are easiest to pick on a dry day. Inspect the seed pods to make sure they are brown and easily cracked open. The idea is to harvest the seed pods before they are dropped from the plant. Use a knife or shears to cut the stem below the cluster of seed pods. Place the cut stems upside down in a paper bag. Some of the the seed pods will release their seeds into the bottom of the bag within a couple of a days. The remaining pods can be rolled around in the palm of your hand. They will break open, releasing the seeds. 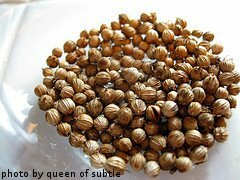 Coriander seeds should be stored whole in an airtight container in a cool, dark area of your kitchen. They can also be stored in the refrigerator. Coriander seeds will stay fresh for up to a year. They can be used whole or you can grind them up, depending on what the recipe you are using calls for. Now that you've learned about harvesting cilantro and coriander seeds, it's time for a few of our favorite recipes that feature both ingredients.